I'm retiring this old tube collector and building two new ones. 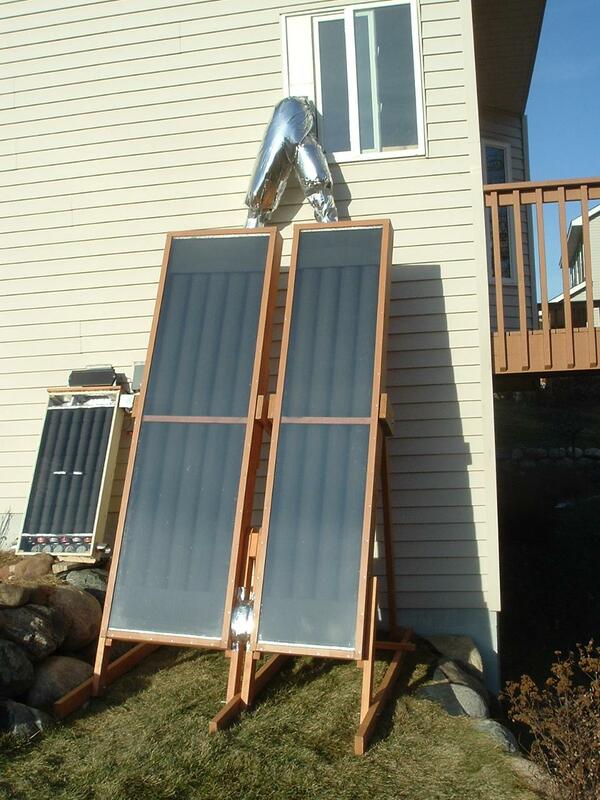 The small collector to the left is a preheater for the air exchanger (Brings in fresh air during the winter. That was my first and last experiment using pop cans). It's not shown in this old picture, but I currently also have a 4x8 screen collector to the right that feeds into the basement. Here is the start of the new collector. It is also using a U-shape path since enters through a window. It's a little bigger than 4' x 10'. I originally wanted to make it 8' x10', but figuring out how to build it in manageable pieces and assemble it each year got too complicated. I'm putting one 4' x 10' collector where the old one was and a second will go up on the deck horizontal. The tubes are 3" semi-rigid aluminum duct. It comes as shown on the left and expands to over 8'. It's very light weight and the ridges may help some with absorption/heat transfer. There will be 13 tubes (6 down and 7 up) with minimal space between them. From the old collector I found that having more on the up side created a natural flow. The full 8' length of tubes will be under the twinwall glazing. Why am I doing tubes (more complicated build) instead of the easier screen collector? The main reason is that I don't want paint anywhere in the air path. The frame is 25 gauge steel stud track. The sides are 10' long. To get enough depth two stud tracks were glued (silicone) and bolted together. There is an end cap at the bottom with 6" legs that slide into the side pieces. 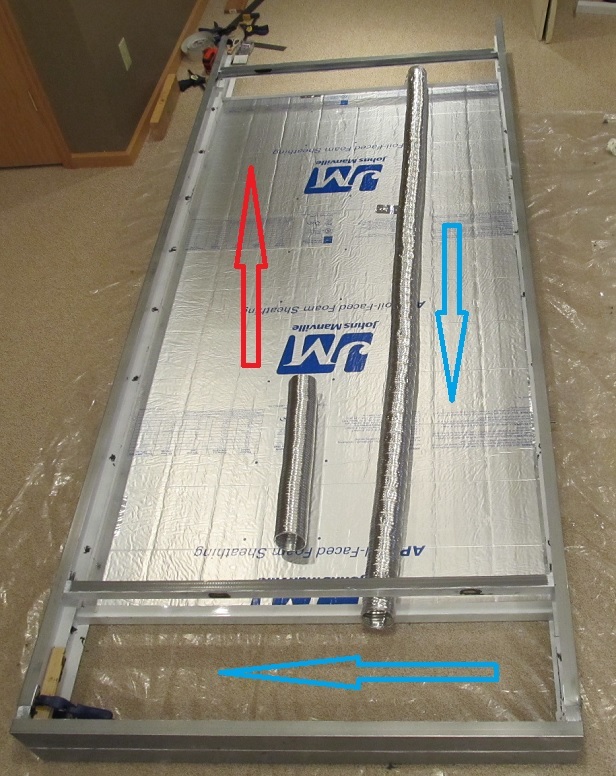 The insulation (3/4" Styrofoam plus 1" polyiso) rests on some cross bars and the stud track sides, but is otherwise exposed on the back. At the 4' ends it is held by 1-5/8" stud track. The two 4' cross bars on top are 1-5/8" metal studs (stiffer than stud track) and will hold the twinwall. There will be strips of wood under the lip of the steel frame to accept the twinwall glazing screws. As more parts are added the frame is getting sturdier, plus it will be resting on a 2x4 A-frame mount. The lower turnaround plenum will be glazed. It will probably just be an aluminum flashing cover painted black on top like the old collector. Not the most efficient, but it will be better than just the plenum by itself. I thought about doing screen inside the plenum but didn't want paint in the air path. The bottom corners will be rounded internally. On the top plenum I'm not sure yet how the ducting will work. Since the box is thick I am going to try to run the 6" ducts straight out the top to avoid an angled turn. The fans will most likely be pulling at the top. The other option is to put the fans at the bottom pushing up the left side but I'm not sure if that would work well due to the way the air is flowing in the turnaround. The fans are 113cfm 120x38mm 12V ball bearing fans (supposed to work at higher temps and can run at an angle). I don't know yet if it will take 2 or 3 fans since I haven't used fans in parallel before. They have a fairly good static pressure rating and this design shouldn't be too restrictive. Next I am going to seal/stiffen the bottom of the lower plenum with 1/4" plywood, make the polyiso tube support boards for each end, and install the tubes. Plus I need to get the second collector going. There is a warm day coming up so I want to get everything ready for painting. There just wasn't anywhere else to put the old collector and I wanted a better collector in that space. I used it three years. It's already been disassembled and I saved/reused what I could from it. 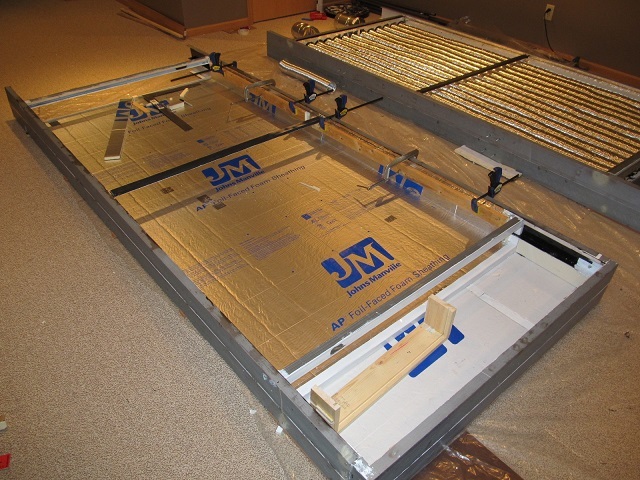 Some of the glazing and polyiso will be used on the bottom plenum of the new collectors. Tubes are installed on collector 1. It's a bit of work to get the semi-rigid duct expanded to 8 feet. After buying a few and noticing there was variation in the collapsed length, I picked the longest ones when buying the rest. The left side plenum will be on top and have 6" ducts coming out of the top to minimize the bends (entry is through the window like the old one). Still need to figure out how to enclose the plenum. The center tube section is about 4'x8'. Painting the tubes is going to be tricky now that it is getting cold. If I can get a sunny day, I should be able to paint outside since the tubes should stay warm. Otherwise I'll have to run warm air through the tubes (space heater) and paint in the garage. The bolts on the side are for wood tabs that will secure the collector to the free standing frame. Originally I was going to put the fans at the top, but decided to put them at the bottom for easier access if something failed in the winter. It may also be quieter with the fans there. The fans will be mounted to a 1/4" plywood board that slides into a slot in the wood box on the right. The air comes down the 6 tubes on the right and goes up the 7 tubes on the left. The top of the plenum will be covered with aluminum flashing and covered with twinwall leftover from the old collector. The fan box has a wood cover that can be taken off to slide out the fans if needed. The snap disc will be at the top on the hot (left) side inside one of the tubes. The second one is going faster since I'm learning from the first one. The plenum is a little longer on this one. great looking collector. i'll be looking forward to see how it performs... especially since the weather went from almost 70F to sub 40F overnight... and it's supposed to stay there for the next 8-10 days. I gotta get started on my second collector! Boy that would be nice for a high during the day! These are the boards that fit into the U-shaped channel in the window. They lock together in the middle with a few bolts. They will be covered with 1/2" insulation on both sides. With all of the sub-zero weather the window is frozen shut so I haven't been able to do the final fitting. I think it will take a sunny day in the high teens to thaw the window out. The ducts are 6". 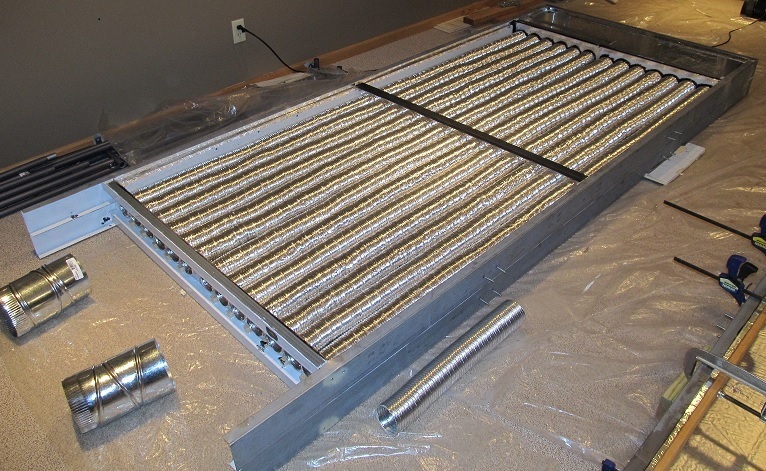 This is the bottom plenum (air comes down the right side in 6 tubes and goes back up the left side in 7 tubes). The fans are mounted on a board that fits into a slot and are covered by the board on the left. I wanted to have a way to access the fans later. The 12VDC fans are rated 113cfm with a 5.91mm static pressure. 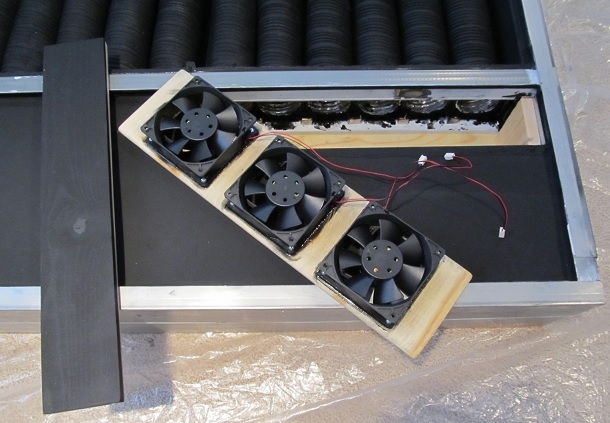 The fans pull air down the cool side into the plenum and push it up the hot side (left). In an early test measuring the fps of each tube at the exit (other end) the outer tubes were getting a bit more air flow than the center tubes as expected. It's due to the U-turn and how the flow reacts to hitting the wall on the left corner. The top plenum is almost finished. I'm going to measure the flow again and if the difference isn't big I won't mess with trying to balance it. Fan board installed (not wired). The snap disc is at the other end in the center tube which will be the hottest. This plenum will be glazed. I checked the airflow this morning. The bottom plenum where the fans are is sealed. The top plenum is covered on 4 sides and has the center divider, but doesn't have the 6" ducts installed. The first 6 tubes which the fans pull air through are fairly consistent. Due to the U-turn at the bottom, the output tubes vary quite a bit (measured at the top where they output). Removing the blockage in tube 11, tube 10 drops to 579. 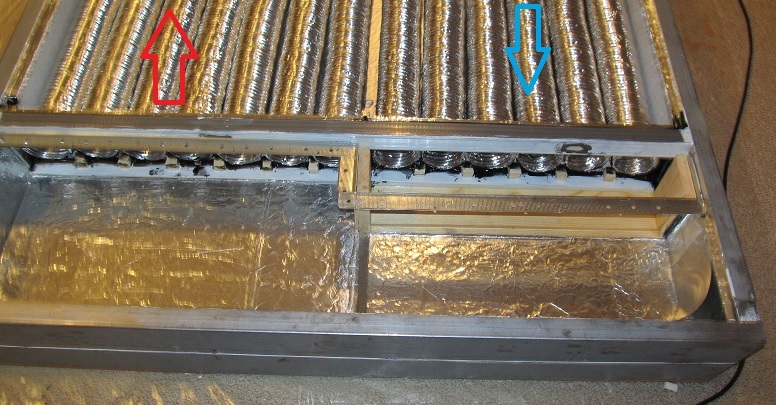 Once the 6" ducts are installed, that may even the flow a little. I think I'll add small restrictions on the outer few tubes (more at #13 and less at #11). There seems to be enough airflow overall. 500 ft/min through 3 1/8" is about 26.5cfm. Can you post an update? How did the fans work out & where can they be found? Will this design work horizontally as that is a better application for my location? The round metal tubes seem to be better than gutters since they have no right angles and will always have exposure, and cheaper to buy. Did you power the fans with a solar panel? Tired of snow in NJ as well. Thank you for your help, look forward to seeing your finished collector.